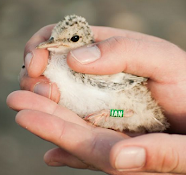 Kilcoole Little Tern Conservation Project: Goodbye, until next year! Today we are saying goodbye earlier that usual as the final pair of Little Terns left the area yesterday. It appears that the majority of adults and fledglings have moved up to Baltray, as reports are coming in of colour ringed fledglings that were ringed here at Kilcoole. Most evenings last week there was a roosting flock of around 86 birds at Baltray. The fencing has been taken down now, as the birds have completely finished nesting for the year and the roosting flock no longer needs its protection either. We would still urge beach goers to keep a careful eye out when walking on the shingle as there are still Ringed Plover chicks hidden amongst the pebbles. This season didn't go too well for the Little Terns here. Although we started off well, with over 150 nests, it all went downhill from there. Halfway through June we had a troublesome fox who made its way into the colony one night, and helped itself to over 40 nests and countless chicks! At the south colony, a mixture of foxes and human disturbance lead to a complete failure of this colony, which had 35 nests. On top of this all this, there was a shortage of food for the chicks late in the season, this lead to a high mortality rate among chicks, even those close to fledging age. This was a similar story to what was seen on Rockabill and other Tern colonies on the east coast. In the end, around 50 Little Tern chicks managed to fledge from the colony, which is significantly below average for this site. Last year there was a staggering 293 chicks fledged! There was also around 20 Ringed Plover chicks fledged from the colony as well, but unfortunately out of the 3 Oystercatcher nests we had, no chicks survived to fledged. We had a total of 126 species of bird seen in the area since the project started back in May, including Hobby, Glossy Ibis, Great White Egret, Cuckoo, Short-Eared Owl, Long-Eared Owl, Red Kite and Great Skua. Apart from the birdlife, we also saw 8 species of Butterfly, including Ringlet and Small Heath. We have also seen Otter, Viviparous Lizard, Harbour Porpoise, Bottle-nosed Dolphin and a Grey Seal dining on a Ray. We would like to thank all of our volunteers that helped us throughout the season this year and all of the public who use the beach around the colony for your continued interest and support for this project. Little Tern attacking a warden!